How kind and giving so many of you lovely supporters of our work are. Today we received two very special Christmas cards from George Downing House residential home, where Music Leader Bernie goes every week to lead singing sessions as part of our 'Keep Singing Keepsake' project. As if they haven't been wonderful enough already, they had a charity collection which they wanted to donate to PMZ! Tucked into the card was a cheque for £500! We don't know how to thank the residents of George Downing House enough, but we do know that their generous gift will bring music to many more people that need it. Thank you George Downing House residents, from the bottom of PMZ's musical heart! TEA, TINSEL AND TONSILS - OH YES, IT'S THAT TIME AGAIN! It's Xmas time again, and we're definitely in a festive mood here at PMZ, especially as we've just had our fantastic annual "Tea, Tinsel and Tonsils" event here at our community music centre in Devonport. It's a fabulous celebration of songs, carols, congas and much more over mince pies and tea cups! We had 65 beautiful older people singing their hearts out along with the PMZ music leaders that we can plainly see they have grown very fond of! There are lots of people in this world that take, take. take. This place just gives, gives, gives. A letter and drawing from participant Chris Burns about PMZ's 'REVERB' music making session for disabled adults run by Music Leaders Anna Batson and Dave England. "It's a Tuesday, meaning one thing, Plymouth is going be kept chilled by the sounds of Reverb. What is Reverb? l hear Francis Drake cries? Reverb is a collection of musicians, playing and creating tunes at Plymouth Music Zone in the shadows of Devonport. It's also when words nd music collide to form magic. Devonport also has a cowboy which has only been discovered. Reverb has courage, determination and soul written all of it. It's where thoughts and experiences can be transformed into sing. I see myself as half musician and half master of lyric and lime. Probably gets too close to words, but when l hear them with music, they come alive and becomes the words of Reverb. Anna is the keeper of the keys and chords and leads the musicians to stardom. Anna is a star already. Dave has already been star and still is. In Reverb no one is alone and the hour vanishes in the fun and laughter. My favourite drive which l don't want to loose. My drum machine is second hand, but it's in the spirit of Reverb.Disabilities can be overcomed at Reverb with the final outcome instalment which astounds everybody. I wear my Funky Llama collar with pride. The Liama can't wait to hear their trilogy in space. My drive home is joyful and filled with wishful memories. The only sadness in the air is the place where l live which has no hope and very little joy." 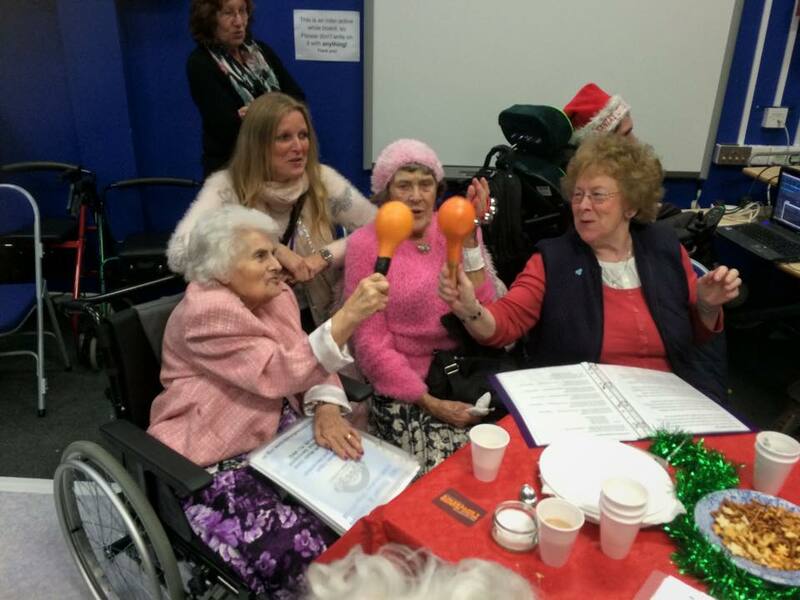 PMZ's 'Keep Singing, Keepsake' project is a special intergenerational music programme created to help reduce social isolation for older people living in residential homes, sheltered housing or supported living schemes as well as in dementia care units. It involves weekly singing sessions and the creation of little audio and video 'keepsakes' that can be shared with family and friends. Our work at Devonport Views is funded by The Big Lottery ‘Reaching Communities’ project. This is what some of the participants said about their ‘Keepsake’ DVDs. We had ours on a few times to show our friends, like. They can’t get over it. My sister said “Look at my sister there talking away!” She was always the one doing everything I was always the one doing the cooking and staying at home and stuff. I never went to parties and now I do. Alan says I’m a late developer! Anyway, a nice bit of music makes you feel like a different person altogether. I can’t be without it. Trevor, Resident, Devonport Views. Trevor can't speak, but he can sing! When I saw it (the film) at PMZ, it sparked me. I was different from what I thought I was – I realised I’m getting older and not looking after myself. There I was on the TV with only one tooth. It’s brought home to me that I need to pick myself up, so I’m much more positive now. I’m much happier. It’s brought a new lease of life to me really. It really has changed my life – I’m not trying to flatter you. I felt like I was asleep and it woke me up. At the 2013 Nick Thomas Awards, Janet Greaves-Stoker won a PMZ Perfect Partner Award. This was her acceptance speech. I’m incredibly honoured to be part of this evening with those wonderful performances. I really want to tell as many people, particularly decision makers and Plymouth City Council, just how important Plymouth Music Zone is to the children that I work with and provide services for. We have some young people who have complex learning difficulties and complex challenging behaviour who can barely communicate to ask for what to eat, to ask for a drink, to ask to go outside. They can’t communicate effectively, but PMZ managed to get them to communicate. The music that they created is just incredible, so it’s a pleasure and a privilege to work with this organisation as a partner and thank you for your recognition, I do appreciate it. People think PMZ is just about music but it's not. It's about changing lives and giving people a chance to feel good about themselves in the midst of everything else that might be difficult. It may not be life and death but it means all the difference to someone who may be isolated or vulnerable in some way. PMZ is a fantastic, all inclusive environment. Everyone is made to feel welcome, my son has an absolute blast and has flourished in a positive happy place. His ambition is to become a music leader which shows what a fantastic time he has. Music should be open to one and all, it's a brilliant medium that all ages and abilities can and should benefit from. Please help to keep this place amazing. From a truly thankful parent. PMZ are a professional, top quality organisation whose work is both ground-breaking and life-changing. They have extensive expertise in working with adults with special educational needs and the impact this work has on participants is priceless. PMZs generosity of spirit and commitment to the work has led them to pioneer partnerships and collaborations previously unseen in Plymouth, enabling more projects, reaching more people, more often. In short, Plymouth would be a far lesser city without PMZ! I have been volunteering at PMZ for five years and was a participant for several years before that. It is a great opportunity for young people to meet new people and learn new skills. It is not just learning about music but life as a whole, with participants learning social skills, team work, respect and confidence. It was particularly helpful for me in learning to talk to and interact with others. Music Making a Difference.... Does what it says on the tin! There's been a lot of money spent over the last 10 years on schemes and initiatives that haven't really made much difference at all. PMZ is without doubt the exception! Value for money? Well I wonder how many millions of pounds have been saved. Hard to quantify, but think of all those young people who didn't go on to be young offenders, or those who didn't end up being funded through expensive NHS treatment for addiction and mental health related issues. These are a just a few examples.... It's more than just learning to sing or learning an instrument (worthwhile pursuits in themselves). As you can see by the amazing comments left here by young people themselves. This organisation transforms lives and long may it continue....! PMZ has thrived in Plymouth for the last 10 years + for one reason, it works! PMZ's strategy has simply been to make a difference in the lives of the people it works with. Literally tens of thousands of you people have now been involved in this organisation’s work. 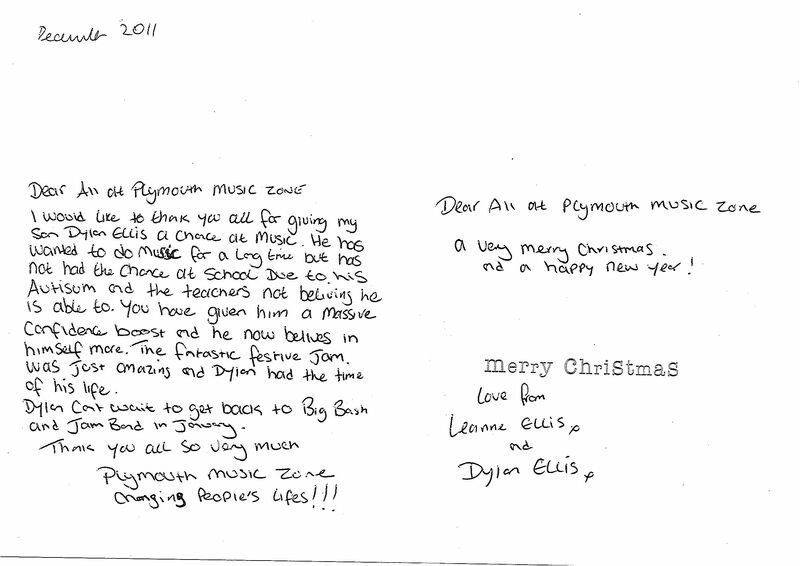 No other music education group in Plymouth or possibly the South West can claim to be quite so prolific. We all know that the next few years are going to be tricky for charities and in particular arts organisations. PMZ’s work is vital and worth every penny, please support this valuable and unique resource. PMZ has that 'Heineken' factor. It's a high-quality participatory learning environment for hundreds and hundreds of young people, its skill development, its career development, its employment potential and it's FUN!!! The creative industries are the fastest growing industries in the SW, PMZ is at the cutting edge of growing new talent and potential that transforms into new jobs and new industries for our city and the region.